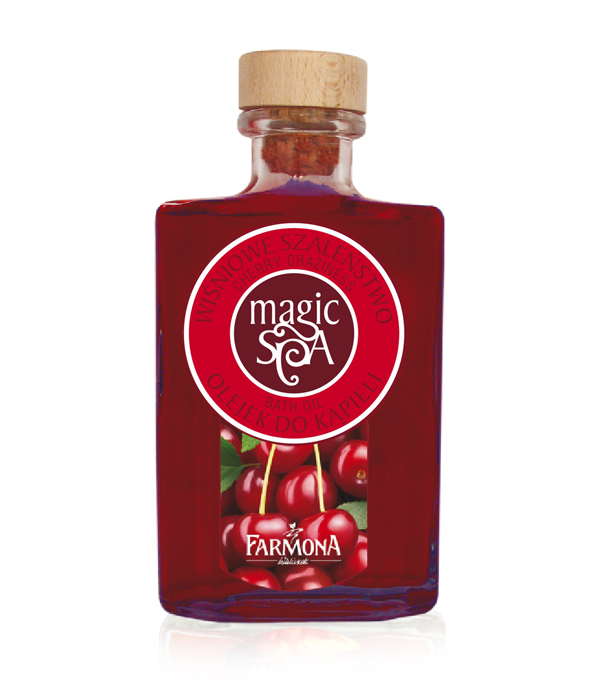 Extremely efficient Cherry Craziness Bath oil with intense aroma of ripe cherries caresses the senses, and active ingredients containd in it – moisturizing HydraIntense complex and provitamin B5 – perfectly nourish, moisturize and smooth the body. Refreshing, slightly pungent aroma of juicy cherries relieves stress, boosts energy and introduces the perfect mood, rich formula thoroughly cleanses and purifies the skin without causing it to dry. Aromatic bath provides a wonderful freshness and relaxation after a busy day, leaving a long lasting soft, silky smooth and pleasantly scented skin. Pour 25 ml of oil into the stream of warm water. Recommended bathing time 20 min. HydraIntense moisturizing complex and provitamin B5.